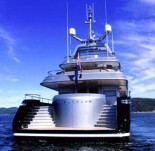 Putty VI is an axplorer yacht built by Palmer Johnson in 1996 and is one of Vripacks most famous designs. Felicita West was built in 2003 by Perini Navi with naval architect Ron Holland, and Nuvolari Lenard as designers. S/Y Felicita West is one of the largest and fastest aluminium sailing yachts in the world. HOKULANI is a new Palmer Johnson 150' (45m) motor yacht as designed by Nuvolari & Lenard. Nuvolari & Lenard and Palmer Johnsons' stunning new 150' Sport Yacht is turning heads wherever she goes.